2.Heat a pan,add the oil.Saute the onions for couple of minutes until it turns slightly brown and pink color.Then,add the ground paste. 3.Add all the spice powders and salt.Cook it for 3-4 minutes.Add the chopped capsicum and a cup of water.Close with the lid and boil it for 5-7 minutes. 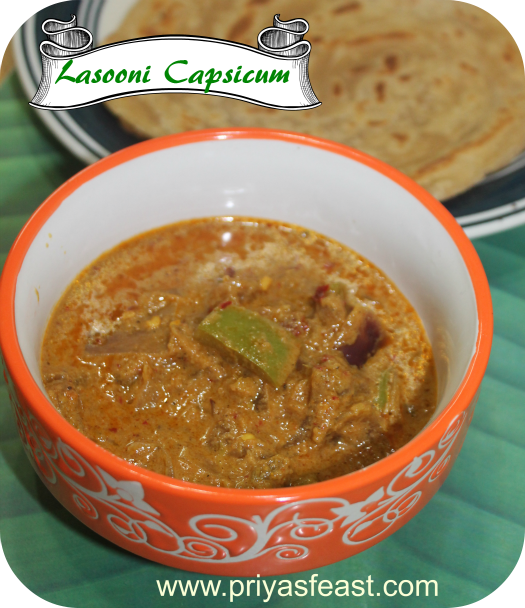 Serve it hot with roti or chappathi.The recipe comes for very little portion ,may be you should double the recipe ,if you are making it for more than two people.Adjust the red chilly powder as it could be too spicy too. I can smell garlic!!!! looks yummy! !